With Andrew Keegan, one of his 10 Things I Hate About You costars. 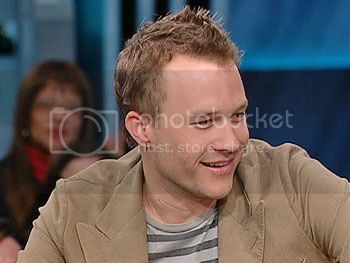 The explosion of Heath pics today has been much appreciated!! Thanks, y'all. Milli, those last pics are how Ennis would have looked that first summer on Brokeback. So young. So hot! Have we all seen this pic? Yes. Oh Courtney, RouxB, and others, muchas, muchas gracias!!! Say what you will about the Oprah show, but darnit, he was cute!